Cute Teddy Bear Shower Decorating Ideas, Supplies & Pooh Bear too! Hosting a "Teddy Bear Shower?" Teddy bears and baby showers make a great combination! We have thrown together some simple and cute shower ideas! There are many cute decorating ideas when it comes to the brown furry creatures! They are so soft and cuddly, what could be better for a baby shower! Boy or girl? It doesn't really matter! Teddy bears are perfect for either one. 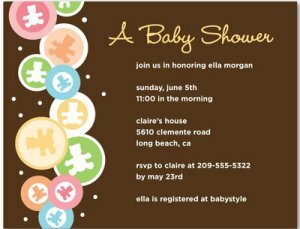 In fact, the color brown is a popular color for baby showers these days! People have been pairing up the once thought dull and drab color (brown) with pinks and blues and it really looks sharp! And for those Pooh Bear lovers out there - We've come up with a bundle of "Pooh Bear Baby Shower Ideas" too! Using a teddy bear-shaped cookie cutter, cut sugar cookies into cute bear shapes, frost, and wrap in cellophane. 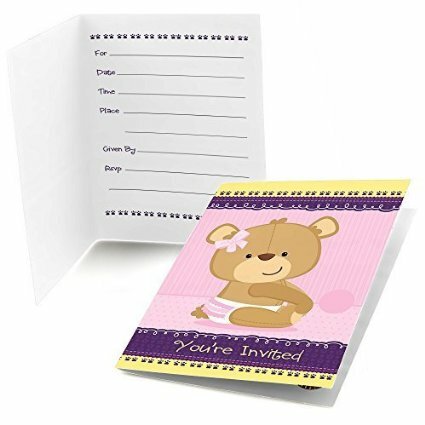 You can even attach a cute tag saying "Thank You Beary Much For Coming"
Sprinkle cute teddy bear confetti all around counter tops and tables (to make teddy bear confetti, buy a bear-shaped paper punch at a craft store or online and punch out several bears using different colors of card stock.) or see below for already made confetti. For a cute centerpiece idea, fill a basket with stuffed teddy bears, a teddy bear outfit for the baby, and other baby essentials - give to the new mom as a gift at the end of the baby shower. Have brown snacks such as sugar babies, nuts and Chex mix in cute dishes. Put a sign on the table saying: "Please Don't Feed The Bears"
Fill a baby basket with cute baby essentials such as onesies, socks, teddy bear print blankets, rattles, clothes and stuffed teddy bears. Who doesn't want a giant pink stuffed bear?! Wouldn't this look adorable in the baby's nursery? 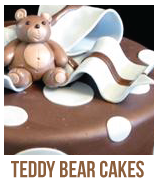 This teddy bear diaper cake makes the perfect baby shower gift idea! You can use it to decorate the gift table at the shower, and then give it to the mom-to-be as a gift for the new baby! And it's adorable! Click on the click to see where to get it. Pooh Bear is a popular and adorable baby shower theme! The Pooh Bear baby shower was voted one of the top showers to throw by you, our readers! Since it is so popular, there are tons of cute ideas to go along with it! We have taken the cutest and listed them here! Enjoy! For cute favors, buy some little terra cotta pots and spray paint them brown. Paint the top a yellow/gold color to look like dripping honey then use black paint or a marker and write "HUNNY" in the center of the pot. You can fill these with candy, yellow soaps, or a cute plant!